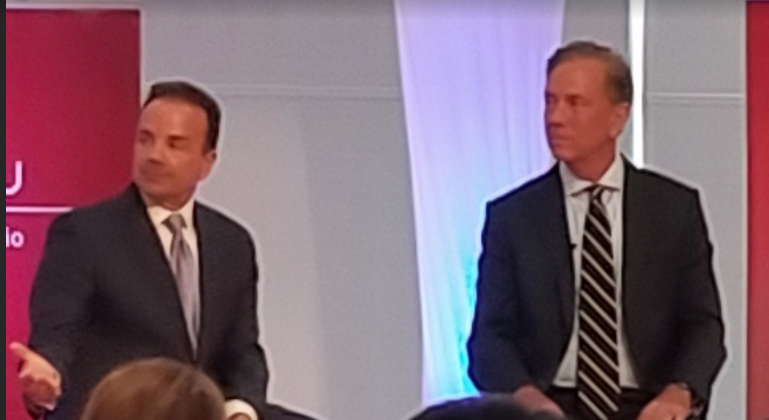 From left, Joe Ganim and Ned Lamont at the Democratic Gubernatorial debate at Sacred Heart University on July 26. Bridgeport Mayor Joe Ganim’s time spent in jail was one of the many subjects brought up at the Democratic Gubernatorial debate at Sacred Heart University Thursday afternoon, July 26. Ganim, 58 and born in Easton, is running against Greenwich business owner Ned Lamont, 64. In response, Ganim said not only were his crimes a “serious error of judgement” but he has learned from them. “I learned lessons about the impacts of mistakes,” said Ganim who is now beginning his seventh term as mayor of Connecticut’s largest city. He added he hopes society will “consider the good in a person” regardless if they have broken the law. The city of Bridgeport has given him “a second chance,” he said, by giving him an opportunity to serve as mayor. Ganim then referred to a saying he said he often tells others: “Every saint has a past, but with that I like to believe that every sinner may be given an opportunity for a future,” he said. Lamont responded that the people of Bridgeport decided that Ganim deserved a second chance when they elected him to be the mayor. “I think he should honor that by finishing the term there — and I told him I would be there as governor, doing what I could to make Bridgeport great,” Lamont said, amidst chuckles from the audience. Moderating the debate, which was open to the public, was Ken Dixon, Hearst Connecticut Media Group political editor and columnist. Panelists questioning the candidates were Gary Rose, professor and chair of the Department of Government, Politics and Global Studies at SHU; Ebong Udoma, senior political reporter at WSHU Public Radio; and Hearst Connecticut Media Group political reporter Kaitlyn Krasselt. The Republican Gubernatorial debate was held on Tuesday, also at Sacred Heart University. On Wednesday, the state Bond Commission voted to spend $10 million for an electronic study to consider reinstating tolls in the state. A panelist said that at Tuesday’s debate, all the GOP candidates were against reinstating tolls. However, Ganim spoke in favor of them since he said it brings in revenue. “How do we get the money from out-of-state residents, truckers included, but everyone who drives to Connecticut from New Jersey, from New York, from Massachusetts, from Rhode Island, from out of town, when we are paying to go through theirs, so with that approach, I say we look at tolls,” he said. While both candidates said they think Republicans in general have not been making wise choices, Ganim said Lamont would be making a mistake by not endorsing him as governor should Ganim win the primary. When the topic of the fatal shooting by Bridgeport police last year of 15-year-old Jayson Negron was brought up by a panelist, Ganim said his job as mayor sometimes limits him from responding in the way that he wants desires. Lamont said, however, that one should listen when a person is grieving over the loss of a loved one. When the topic of untruthful politicians was brought up, Ganim accused his opponent of claiming many untruths.